Jessie Chung is an international recording artist and actress based in Australia, currently under the management of Future Entertainment & Music Group. She is the only Malaysian artist who has stormed foreign charts, including the prestigious Taiwan 5 Music International Chart, and the I Radio Top Hits Chart. True to her multitalented status, she is also a doctor of medicine in oncology, naturopathic doctor (US), certified nutritional consultant (US), homeopathic doctor, certified iridologist, biotech researcher, accomplished entrepreneur, author, martial arts coach, and philanthropist from Malaysia. Besides holding a doctor of medicine degree (M.D.) in Clinical Chinese and Western Integrative Medicine—Oncology from Guangzhou University of TCM, China, she also possesses a MBA from The University of South Australia and a BSc. in Acupuncture and Oriental Medicine from Oriental Medical Institute, Hawaii, USA. In recent years, she was the only naturopathic oncologist selected as one of the Hummingbird Cancer Centre leading members to head their natural therapy department. Her passion for music was evident at a young age as she racked up numerous singing competition awards. In junior high school, Jessie was the only youth representative in the entire district selected to sing at the National Day Celebration. She then proceeded to perform on many TV programmes in subsequent years. Her high school years in Canada was highlighted by her participation in an international talent contest held by TVB, and she successfully entered into the finals at the ripe age of sixteen. Besides singing, Jessie also has a gift for musical instruments, passing grade 8 organ at a young age with distinction, under the examination of Japanese auditors. After her studies, she devoted herself into the entertainment industry and charity; so far, she has released eight albums and starred in three feature films. In 2013, she took on lead actress in the Chinese film Faces and Malaysian film Unchanging Love. She also appeared in the 2014 film Kungfu Taboo. She is known for her ebullient and enigmatic concert performances in countries all around the world, including the United States, Canada, China, Taiwan, and Malaysia. With experience in dozens of concerts in five different languages, Jessie yielded huge responses from fans around the world during her 2015 Love Unity Concert, leaving barely any space in the arena. Building on her success from the previous year, she proceeded to perform in the Jessie Chung Exquisite Chinese Orchestra Concert in 2016, selling out all ten performances. Besides touring and performing in concerts, she has also starred in several stage plays, tackling lead roles in Malaysia, Singapore and Canada. Her recent stage production Moonlight was also well received by the visual arts community, and the organizer has brought Moonlight to numerous locations around the country. By now, she has released six Chinese albums and two English albums. Her single Love in You was selected as the theme song for the Korean TV series My Secret Garden in Taiwan, whereas her album of the same name topped Malaysia’s aiFM Top Hits Chart, staying at number 1 for many consecutive weeks. In China, her album Loving You charted among the top 10. Her recent album Tearless Sky rose to 4th place on the I Radio Top Hits Chart and 6th place on the Pop Radio Top Ten Music Chart just within two weeks of initial release in Taiwan. The album was well received by the public and has received appraisal from music journalists. 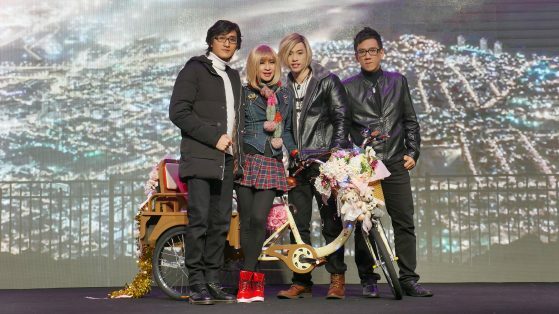 She has appeared on numerous TV shows in Taiwan, and her album was strongly recommended by the TV hosts of the programmes, one of them being Kevin Tsai (Cai Kang Yong), in his legendary TV show Kangsi Coming. Exhibiting a strong presence on TV shows, Jessie has recently been invited to host TV shows in both China and Australia. Besides, she authored Stay Away from Cancer, Stay Away from Diseases, and the Jessie Diary series, informing the world with her medical experiences while also giving them a peek into her soul. She has authored more than ten literary and medical works to date, most of them in English and Chinese, with translations in Malay. As an accomplished martial arts practitioner, Jessie has successfully achieved the 5th Duan of Chinese Wushu Duanwei; she is also a certified Wushu coach, referee, and instructor. She has won a total of 12 gold medals and 5 silver medals in various international Wushu competitions. Jessie has been honoured with countless awards received from various ministers of Malaysia for her achievements, particularly two awards from the prime ministers of Malaysia.